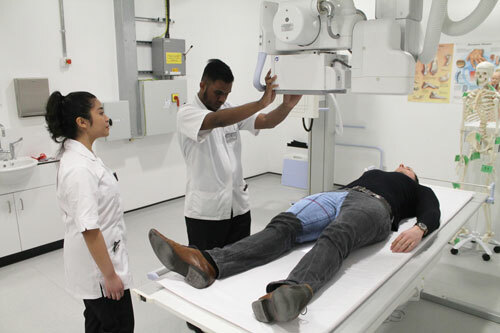 The School of Health Sciences at City, University of London has unveiled a new, cutting-edge radiography system following a generous £150,000 donation from the Wolfson Foundation which was secured by the Development and Alumni Relations Office. 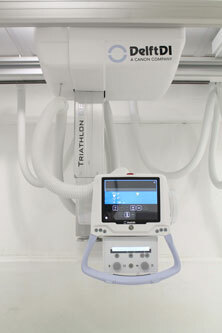 Used for teaching in the School’s Clinical Skills Suite, the advanced Triathlon T3 Precision radiography system will enable the delivery of high quality images, in a faster manner. This will allow for a much smoother and more seamless student experience. The new equipment will also better prepare students for a career in radiography by familiarising them with the equipment used in most hospital imaging departments, helping to provide students at City with the skills they will need in the workplace and enabling a more seamless transition. It will also ensure that teaching is more focussed on technique and image generation, and is less time consuming as the new equipment offers assisted mode that can be switched on and off. This is useful when teaching students at different points in their training, offering more support for those in the early stages of practical experience. The Radiography Department at City, University of London was founded following the merger of five of London's top radiography schools. Facilities within the radiography skills suite offer a learning environment which aims to mirror many of the facilities students will encounter whilst undertaking their practice placements in hospitals which include The Royal Free Hospital, University College London Hospital and St Bartholomew's Hospital and Southend University Hospital. The department delivers courses at both undergraduate and postgraduate degree levels in the areas of diagnostic imaging, radiotherapy and oncology, computed tomography, medical magnetic resonance and radiography. City’s radiography clinical skills suite also includes a life-size virtual radiotherapy environment, which ensures good preparation for the real world of work. Students are able to benefit from a hands-on approach to x-raying various anatomical regions, free from the demands of patients, allowing for a more structured learning experience.